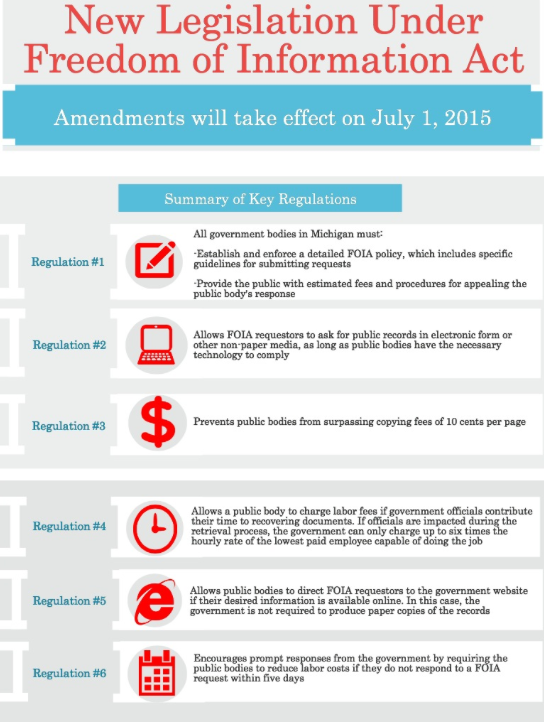 New legislation under Michigan’s Freedom of Information Act (FOIA) will require government bodies to enforce a comprehensive policy and modify specific procedures for responding to FOIA requests beginning July 1. Government entities will be expected to provide the public with detailed guidelines for submitting FOIA requests, including information on estimated charges and opportunities to appeal the public body’s response. Aside from encouraging more accountability within Michigan government, East Lansing FOIA Coordinator Marie Wicks said the amendments focus on reducing the costs for the public requestors. “Some cities see it as a revenue stream, but it cannot be this because that defeats the whole purpose of being accountable and transparent,” Wicks said. The legislation prevents public bodies from surpassing copying fees of 10 cents per page. Another revision allows public bodies to charge labor fees for government officials to recover documents. In such cases, the law states that the government can charge only as much as six times the hourly rate of the lowest paid employee capable of doing the job. “Our attorney believes that we shouldn’t charge his time because he feels it would have a chilling effect on people requesting information, and we don’t want to be about that,” Wicks said. Wicks said FOIA requests for email records require increased labor charges because multiple departments are impacted during the retrieval process. According to Herschel Fink, legal counsel for the Detroit Free Press, these labor charges that act as a prerequisite for obtaining public records are the biggest issue that news organizations face when submitting FOIA requests. “What we (news organizations) encounter frequently are public bodies that make inflated demands for labor charges, knowing that it will be, as I call it, a brush-back pitch at the requestor,” Fink said. Fink said the old act limits labor fees to the “exceptionally burdensome” requests, but the revised act fails to address this. “Labor charges to comply with requests are the exception and not the rule,” he said. Despite his uncertainty, Fink said the provisions creating a cap for copy costs and penalizing the government for delays should have a positive effect. Mark Grebner, an East Lansing attorney, shares similar doubts about the amendments. “Everything was watered down, taken out, removed and fixed so that the public does not really have any better access than it had before,” he said. Under the new law, Grebner said individuals no longer have the right to an independent judge, which forces them to sue in the jurisdiction where the defendant resides. As an attorney who frequently accuses governments for failing to comply with FOIA requests through the suppression of information, Grebner said this change is detrimental because defendants are at an advantage with a judge from their hometown. While the procedures of responding to FOIA requests have always faced criticism, Wicks said she hopes that the revised act will provide some consistency across Michigan and help to appease frustrated citizens who request public documents. Wicks said East Lansing citizens should not anticipate major changes in July because the local government has had a FOIA policy since 2010, which “substantially complies” with the revisions in the new act. “I don’t feel all of the changes are absolutely necessary in our case, however, my hope is that this brings attention back to the issues,” she said. In addition, Wicks said the amendments create an opportunity to increase training and education for FOIA coordinators and other city officials. “Let’s do things right and maybe we can lessen the suspicion of government by working collaboratively,” she said. Brittanie Chludzinski is a senior journalism student at Michigan State University with a concentration in visual communication and a minor in public relations.